SendinBlue is a marketing service provider with many great features that you can use to boost your business. Other than automating and managing your email marketing campaign, it gives you also SMS messages, which is really an interesting plus. The easy to use platform is really intuitive and lets you start right away after registration (without paying). Yes, there is a completely free plan, until 9,000 emails per month! With so many overpriced email marketing platforms out there, SendinBlue is the perfect alternative to MailChimp. Let’s see how to sign up with a free plan, how to build your first campaign, the SendinBlue features and prices, with many comparisons to MailChimp. Registration is so easy, that lets you start working on your marketing campaign right away. Once you have signed up, you will get access to your dashboard with complete functionality to all the features. As mentioned, the free plan (yes, it’s really free, without any contract or hidden fees), allows you to start working on your mailing list, without paying and with unlimited use (until 9,000 emails/monthly). You’ll have 300 available emails per day and 100 SMS credits. With MailChimp, the free plan gives you just 2000 contacts and they charges you $50 per month for 5000 email sent (without giving you the autoresponder service), while SendinBlue makes a big difference with 9000 free mails per month and the autoresponder tool. This is great for beginners who need to work on growing their business without investing a lot of money. After signing in, you want to import your subscribers via CSV file or by adding them manually. When you have done that and updated your information, you can start your first email campaign. Just click on “Create a Campaign” at your SendinBlue dashboard and fill the settings. The next step is decide which to use among the 4 editors, in order to create your email campaign. 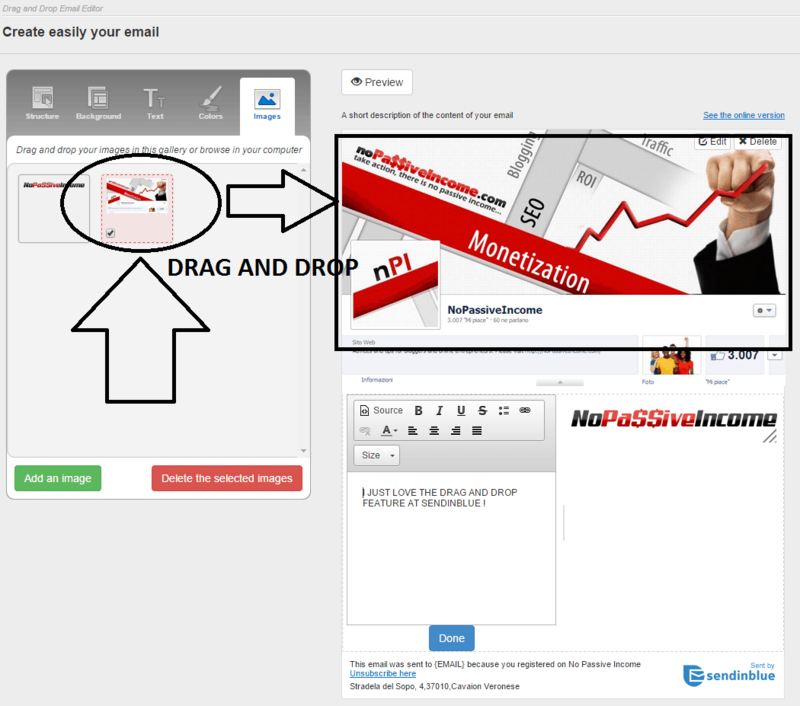 I love the drag and drop newsletter builder, it’s so intuitive and easy to use. Just select sections to add images or texts, and you will be able to build your newsletter in a matter of minutes! There are buttons available, dividers and even an easy social media section that you can add and personalize. After you finished to write your newsletter, you can send a test to your email or even check how it will look on different browsers or several devices, like iPad for example. Last step is including your recipients and schedule your campaign. We’ve seen how to create your first campaign with the easy to use drag and drop builder. But there are many others features at SendinBlue. I am sure you own a smart phone, a tablet or many other mobile devices. After gathering the numbers of your subscribers, you will be able with SendinBlue to send messages to your list, with no distinction of destinations or mobile carriers in all around the world. This is really a plus, that MailChimp does not offer you. With shared server you can send just a limited number of emails each hour. This is due to technical reasons, as your hosting service does want you to use all the server resources. But with SendinBlue this problem is solved. They will connect your WordPress blog to their strong SMTP server, enabling you to send unlimited emails from your website. – heat map consult for checking the most clicked parts on your newsletter. And the unlimited support from SendinBlue staff by phone, email or ticket. While SendinBlue still offers many important features like MailChimp (plus some unique ones, if you check the image above), there is a big difference in prices. 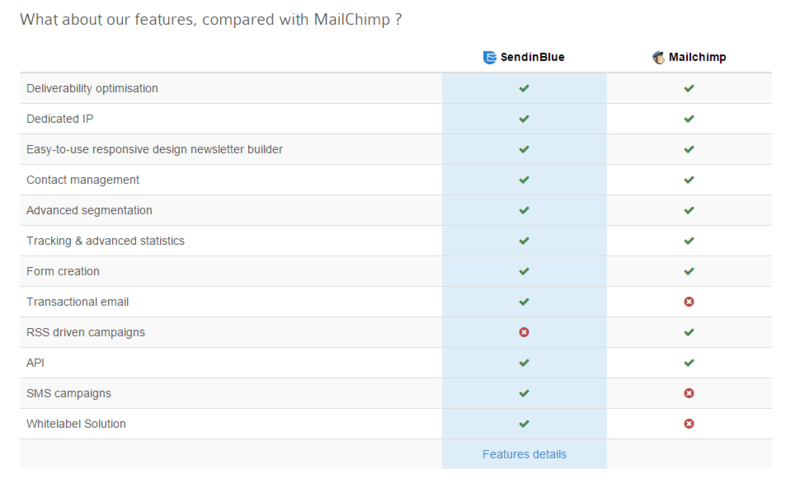 MailChimp is much expensive than SendinBlue. 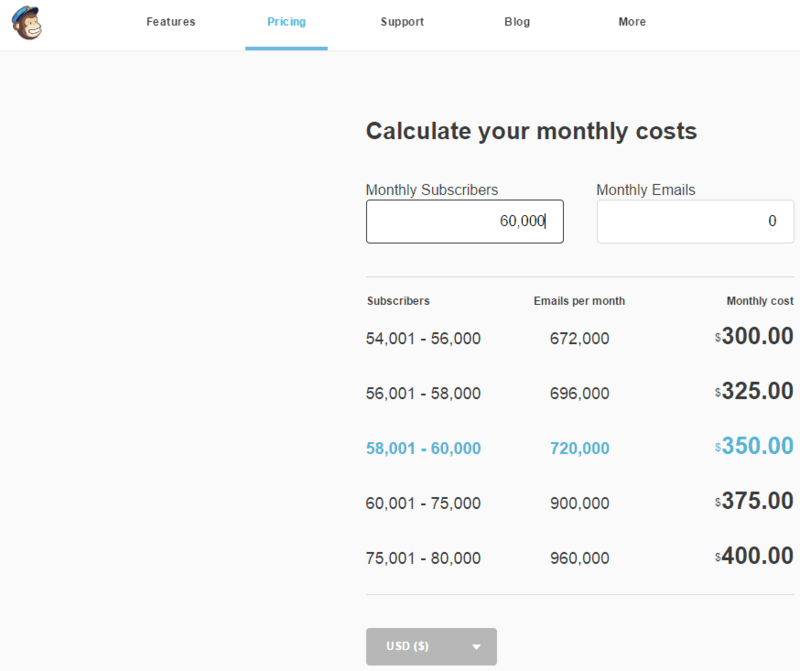 As mentioned, SendinBlue’s free account allows you to manage up to 9,000 emails each month with unlimited subscribers. For example, the “Bronze” package will cost you just $29,00 per month, giving you up to 60,000 emails. You may want to send an 1 email to 60,000 subscribers, or 2 emails to 30,000 subscribers per month. I’ve checked the correspondent MailChimp package. It’s an exorbitant $350 per month!!! That’s more than 12 times of what you would spend with SendinBlue. It’s a big difference of cost, right? It’s really possible to increase dramatically your ROI with a corret email marketing campaign and the proper service provider. 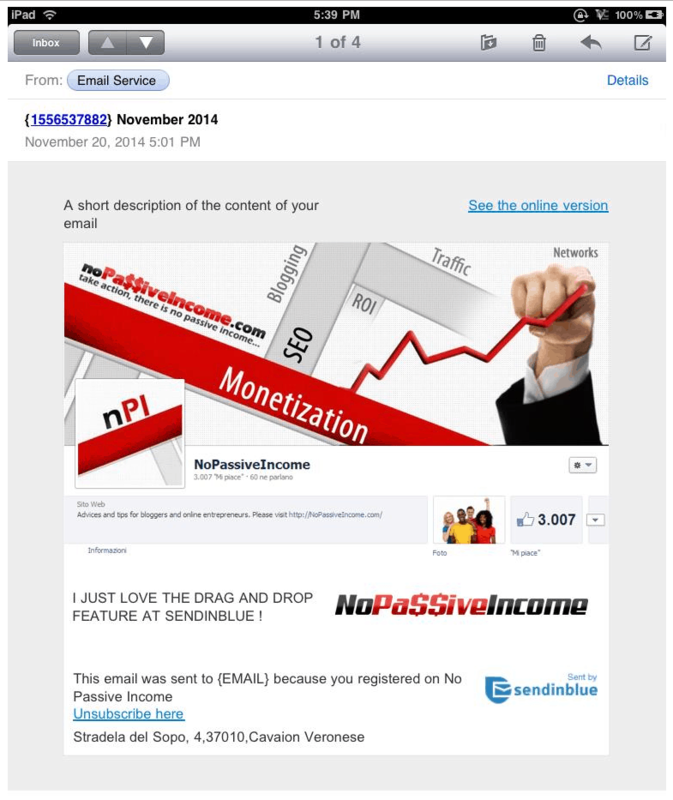 I loved to test SendinBlue and I’ll consider it as my next email marketing service provider. 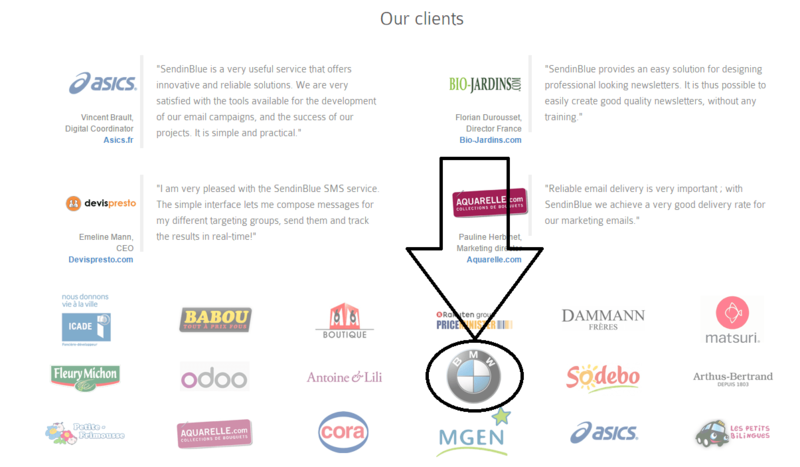 And it’s good to see BMW, among the many SendinBlue clients! SendinBlue gives you so many features, and I particularly liked the drag and drop feature. It’s really intuitive and simple to understand, even for new marketers and bloggers. Also, SendinBlue plans are really interesting, with advantageous prices. You should really consider trying Sendinblue, most of all if you are already using other service providers, like the much expensive MailChimp. You can sign up here for free, without deposit, contract or credit card required. And you can cancel your subscription at any time. Are you managing a newsletter? Are you creating your mailing list? Do you use MailChimp or other email marketing providers? Please let me have your views in the comments below, thanks! Thanks for recommending this site for e-campaigns, the SMS feature is surely a plus. have you registered yet at SendinBlue? $350 a month for a similar package? Pretty big difference.. Thanks for sharing the super helpful review here with the awesome screen shares. It makes SUCH a big difference to see graphic representations of products, up close and personalize….especially for tech terrified folks like me lol! I’m glad you liked the presentation with graphics and screenshots. Hoep you’ll take a look to SendinBlue. Thanks for reading and commenting, my friend. I’d like to hear your experience, once you’ve tried SendinBlue. SendinBlue is Good competitor to mailchimp because of low cost and Easy UI. Though I use mailchimp for my website I am eagerly joined sendinblue and sent some trail campaigns . So you have an account at SendinBlue, Mohanraj? Please share your feedback here. Good to hear that, thanks for sharing your experience. Now I will try this one. Thanks for sharing your experience with MailChimp, Ranuka..
Be sure to try SendinBlue and let me know how it goes! I think this will be a really good alternative for me. Thank you! Thanks for introducing with SendinBlue. Currently, i’m using Mailchimp and it’s really a great tool for email marketing. But the problem is, the designed Sign Up form is not available in Mailchimp. Great to hear you learned something new. Sign up to SendinBlue and let me know how it goes! Nice and informational post Erick. The over all flow of the article was amazing and I loved reading the whole post. Well, these days E-mail marketing for business more specifically for bloggers is becoming a use to effort because its such a good and effective idea to generate leads plus lots of targeted traffic. Glad you liked the post, Ammar. It seems to be a good alternative of MailChimp. I really liked it feature of SMS notifications which would really drive a lucrative flow of referral traffic to our blog. and the price is really convenient, in relation to MailChimp! 12 times less for the plan mentioned in this post. I’ve never heard of SendinBlue before, and from your description, I think it’s really a nice one, atleast the 9000 free mails per month and the autoresponder tool are really great feature. Thanks for sharing, and do have a wonderful day ahead. The free plan is amazing. So much offered without paying. SendinBlue will be my next email marketing provider. A very wonderful review in which you covered all the main benefits and why newbie can try it without second thought as no any hidden cost is involved to get the complete free package. Inclusion of autoresponder in free package is its distinguishing feature that put it quite ahead of rest of the other free email marketing services. I think with the massive growth in competition everywhere around the corner in blogging now suppliers are offering every possible benefit first to make loyal users and then turn them into customers. Thanks a lot for sharing this useful info related to this amazing product. Hope you consider trying SendinBlue. Hope you are doing great. Sendinblue is definitely better, just mailchimp is much more famous. The number one reason for anyone to choose Sendinblue is the ability to send autoresponder which Mailchimp lacks. Nice review man. Keep it up and take care. everything is great, thanks for asking. Are you giving SendinBlue a try? The free plan is definitely worth it. Nice share. Thanks for sharing the detailed review of sendinblue, I am confused between madmimi and sendinblue, can you tell me which one would be the best option to go with? Both are email marketing providers, Kuldeep. Thanks Enstine bro for quick response. Actually I was using aweber for email marketing till now and sedinblue is really new to me and eager to use it soon. You should give it a try, Vino. The free plan gives you up to 9000 emails/monthly, which is great for people who need to build their base of fans, without having too much money to invest at beginning. Actually I was using aweber for email marketing till now and sedinblue is really new to me and eager to use it soon. Thanks for the useful information. I will look forward to your next article. Thanks for sharing, that is really useful to me. Glad you found something new in this post, Swing. Great post and yes, not many people know about Sendinblue option. I’m french and I stumble upon this website (Sendinblue Avis et Examen) when I searched for alternative, after few month of use I can agree with you, I like it better than mailchimp, but maybe it’s a matter of taste? Thanks for dropping your views, Nathan. nice for sharing this article.You have clear my confusion regrading Sendinblue option. glad you enjoyed my review of Sendinblue. I agree with you Erik, Sendinblue is a really nice emailing platform. Love their features and of course, their prices! Glad you confirm the points in this post, thanks for sharing your views Natan. I remember writing about this platform in the past. You know I moved from AWeber to INinbox and have been with them till date. since my last experience with Sendinblue, I have them on my list should I have any issues with ininbox. I see INinbox offers a juicy free plan, up to 2,000 contacts and 20,000 emails. Thanks for checking the post and leaving your comment. Have a good week, mate. I will start with free plan of sendinblue, as you said in the article. Thanks for checking this post about SendinBlue, Ravijit.